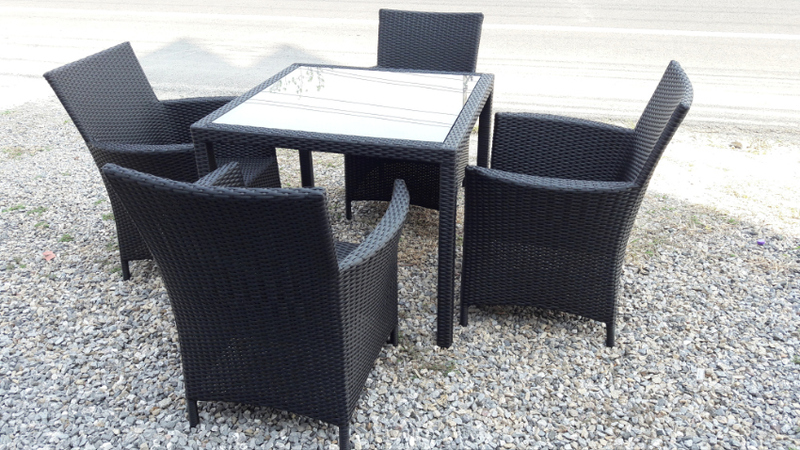 We are a family run small factory specialized in rattan furniture. 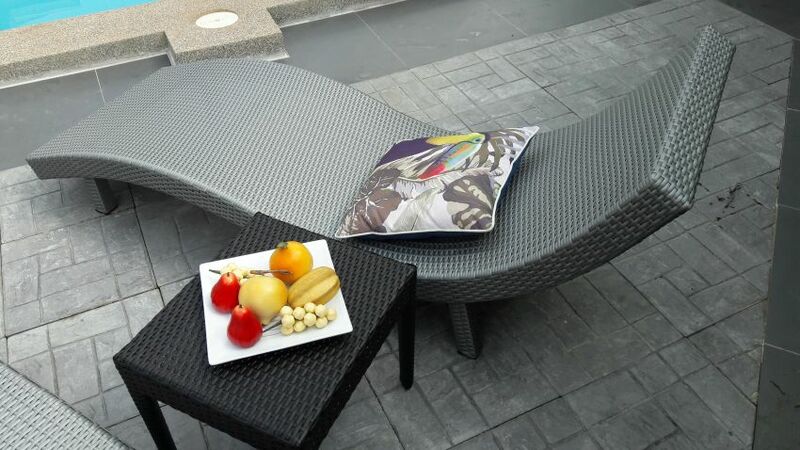 We work with high grade Polyrattan, which is made in Thailand. Each piece is handwoven on a strong aluminium frame, the rattan material is waterproof , UV protected and can be used outdoor all year round . We have a lot of colours for water repellant and UV resistant fabrics and leatherette which you can combine at your taste with the colour of your furniture. 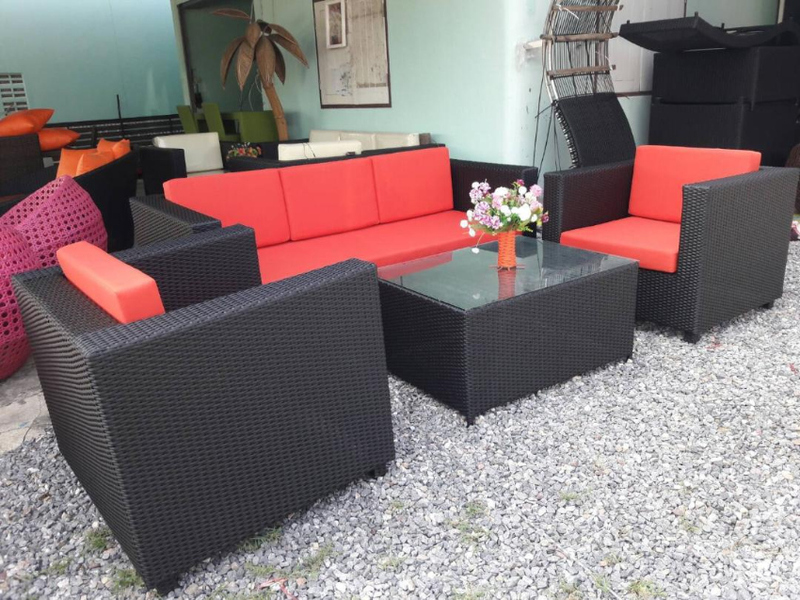 Below you find some of our "standard" designs , complete lounge sets, sunbeds , bars and barstools , dining tables and chairs. For further information please call or LINE. We speak english, wir sprechen deutsch, thai . Please enquire for your personal style . 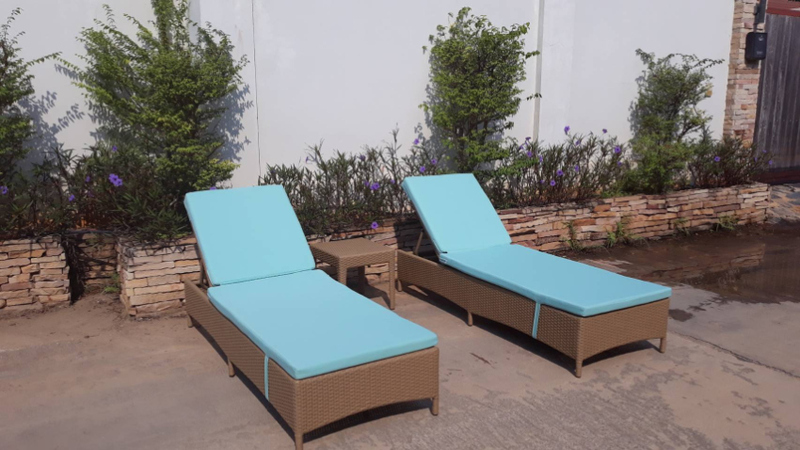 ...this is one of our classic and very comfortable lounge chairs , poly rattan, waterproof and a perfect outdoor furniture . 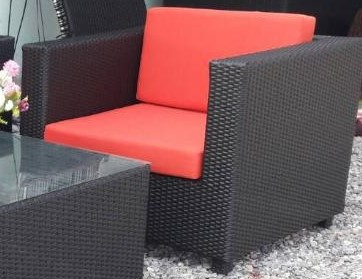 You can select out of many rattan colours and a lot of UV proofed fabrics or leatherette colours . Please have a seat and have a look at our selection. 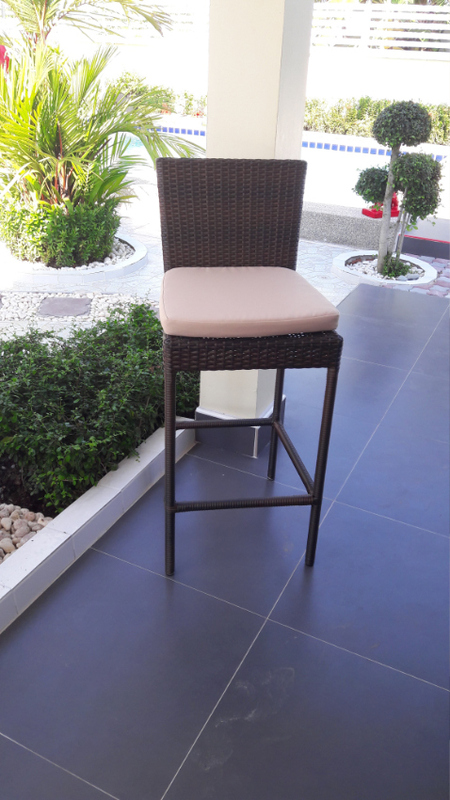 Every piece of furniture is based on a strong aluminium frame and covered with handwoven rattan ( made in Thailand ) . Your personal design can be made by order . Please make an appointement either by phone , LINE or email . 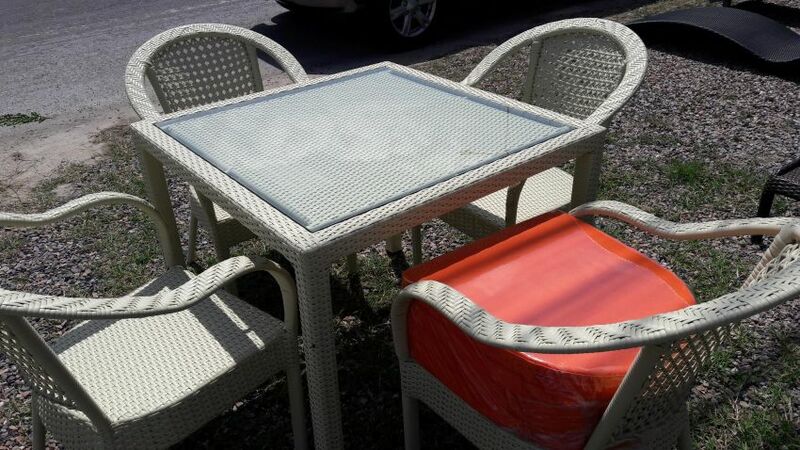 elegant dining table set with 4 chairs, diff. colours avail. ...a well dimensioned and elegant dining table set, includes a square table and four chairs, different designs and colours are available at your choice. 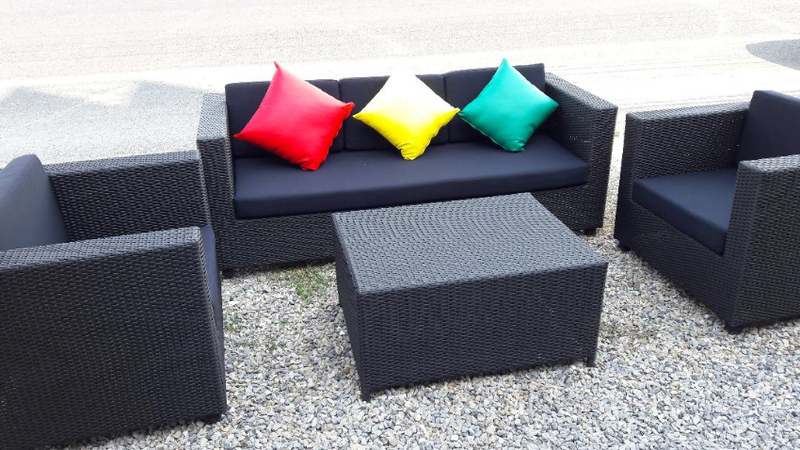 This set is a perfect outdoor furniture the whole year round, waterproof, UV resistant, no colour fading , as we used a strong poly rattan material made in Thailand , which is handwoven to a strong aluminium frame. The chairs can be combined with a high quality water repellant fabric seat pad at your colour choice. NOW REDUCED TO 17.500,- !!!! Design your personalized dining set , it will be ready in 10 days . View by appointement at your convenience . 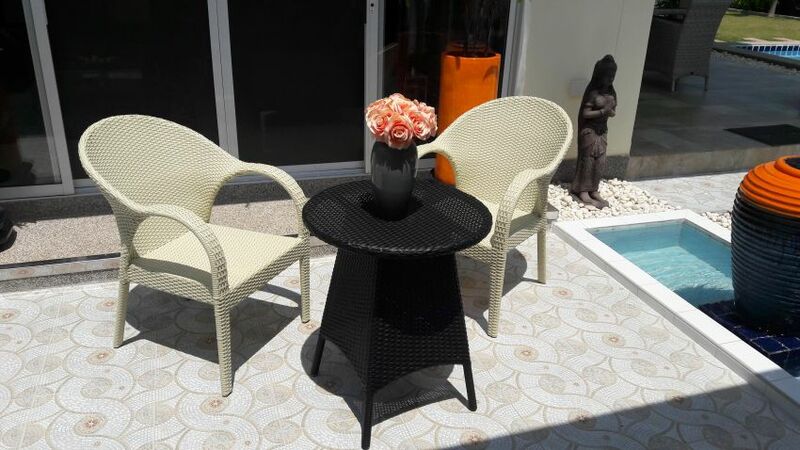 selling our beautiful Bistro table set, synthetic rattan , the chairs come in biscuit cream color, the round table comes in charcoal black. The whole set is available at reduced price only 8.990,- THB incl. seat pads in black leatherette. . For further information please contact Khun Pornchanok. 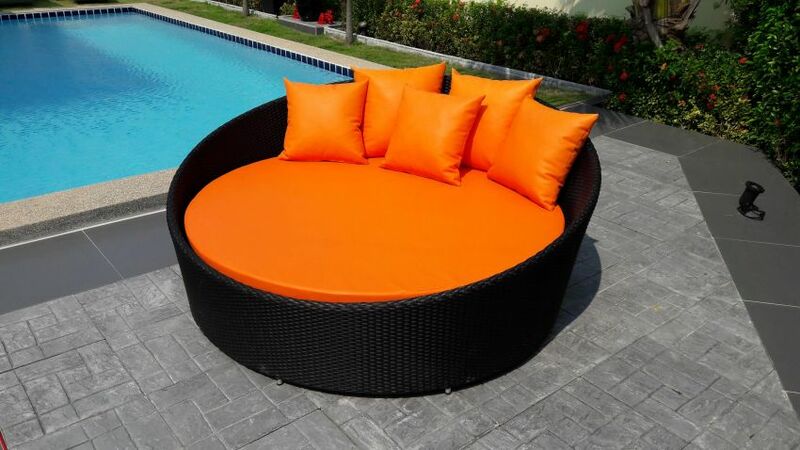 Seat pads can be ordered also in high quality water and UV resistant fabric at 1.450,- p.pce. . 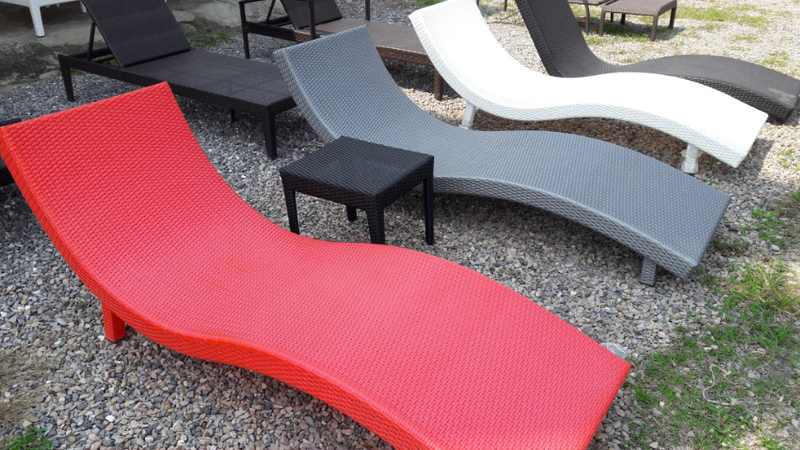 This is a very extravagant sun lounger, model " The Wave " in stone grey synthetic rattan . It is almost new , is 100 % waterproof, can be used outside whole year round . Selling price for quick sale is THB 5.900 each only. There are total two sunbeds available, a matching table comes at 1.000,- extra. Seat pads in cream leatherette are also available at 1.300,- each .